An open studios event, Slow Art Day 2012 at the Chinese Arts Center in Manchester, United Kingdom, saw a steady stream of 88 visitors slowly enjoying art while interacting with the artists and enjoying a snack of slowly made food (10-day sourdough, Amish Friendship Bread, tea eggs, cheese, radish seedleaves, and ginger beer). 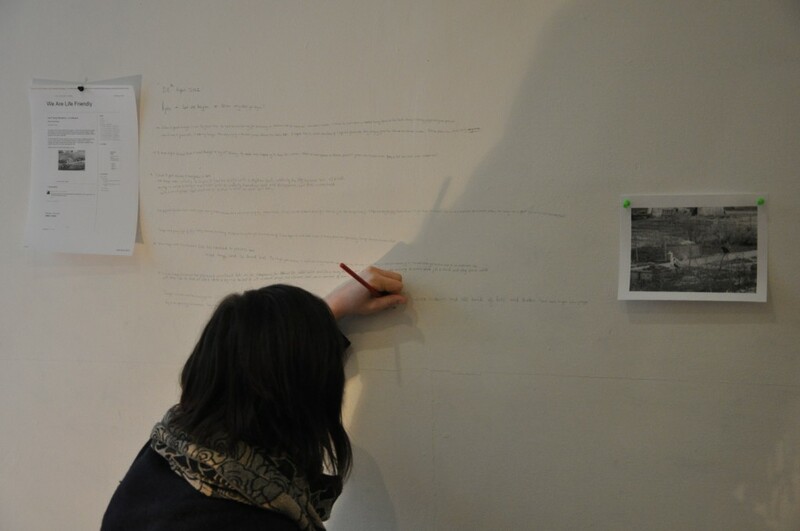 Hosted by a collective of artists in residence, the pieces visitors viewed were all contemporary, nontraditional works-in-progress by members of the Life Friendly Collective, including many interactive elements, such as a collaborative story on the gallery wall initiated by Elizabeth Wewiora (pictured below). Visitors felt the context of Slow Art Day made them more likely to spend time thinking about as well as participating in the art pieces, and the overall response was very positive!